Don’t get us wrong, Kim Kardashian has worn her fair share of sophisticated dresses for red carpet events (she’s sported a long, covered-up cape dress in both black and white), but as far as suits go, Kim hasn’t worn many. When she does opt for coordinated separates, they’re usually finished with an unbelievable plunging neckline that allows her to bare some cleavage. There’s nothing wrong with that but there’s also nothing wrong with Kim’s latest look for the Forbes Women’s Summit: a deep blue pinstripe suit with a double-breasted blazer and matching trousers. 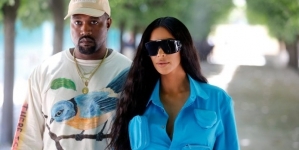 Perhaps we have the rise of the new power suit to thank for Kim’s modest moment as she follows in the footsteps of stars like Rihanna and Victoria Beckham. Who are adopting elevated new shapes into their wardrobes. Scroll to see how Kim paired the power suit with stilettos, then shop her notable outfit.